Pull two flaps out following the arrow directions of the step #24. 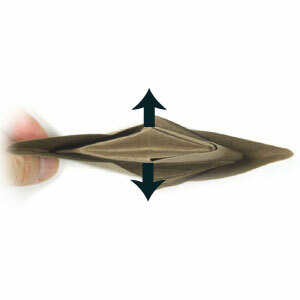 If you are satisfied with a 2D origami cowboy hat, then you can stop here now. If you want a 3D cowboy hat, we need more work to do. Prepare to rotate the hat by 90 degrees. 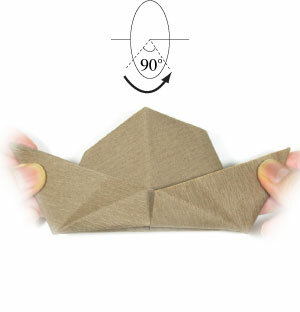 Rotate the origami hat by 90 degrees. Prepare to extend the top of the hat following the arrow directions.